A man has been arrested on suspicion of murder after a 17-year-old boy was stabbed to death in west London. 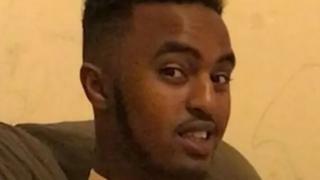 A group of men pulled up in a vehicle before chasing Abdirashid Mohamoud through Syon Park and attacking him outside a block of flats in Union Lane, Isleworth, on 22 March. The teenager, from the Brentford area, died of multiple stab wounds. Police said a 22-year-old man was arrested on Saturday on suspicion of murder and has since been bailed.